Tax cuts often look like “free lunches” for taxpayers, but they eventually have to be paid for. In “Cutting taxes and making future Americans pay for it: How Trump’s tax cuts could hurt many households,” (PDF) William Gale, Surachai Khitatrakun, and Aaron Krupkin examine the distributional effects of tax proposals consistent with those the Trump Administration produced in April. 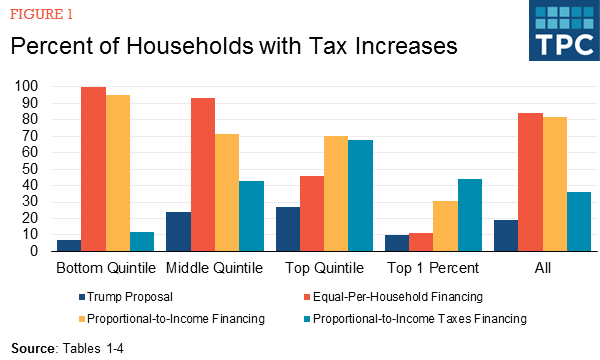 Using Tax Policy Center estimates, the authors show that the proposals would reduce taxes for most households, with the largest percentage increases in after-tax income going to households with the highest pre-tax incomes. The authors find that, under the first two financing scenarios, the vast majority of households, especially low- and middle-income households, would be worse off (i.e., would have lower after-tax income) under the proposals consistent with the Trump Administration’s outline than under the status quo. For example, households in the bottom quintile would lose an average of $2,250 under equal-per-household financing and $320 under proportional-to-income financing. Overall, 84 percent of households would experience a net tax increase under equal-per-household financing, while 82 percent of households would experience a net tax increase under proportional-to-income financing. Results under the third scenario are a little more mixed. If financing is proportional to income taxes, about 36 percent of households would face net tax increases. As before, the top 1 percent, especially the top 0.1 percent, would receive the largest increases in after-tax income.